South Asia Partnership-Bangladesh is a national level NGO devoted to promote the socio-economic condition of the poorer section of the community in Bangladesh since its inception in 1984. 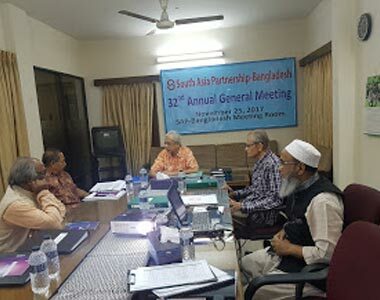 South Asia Partnership-Bangladesh (SAP-Bangladesh) is one of the key actors in the NGO development efforts in Bangladesh, working for building the capacity of small and mid level NGOs and promote rural development in Bangladesh by implementing the pro-poor projects. It began its operation in Bangladesh in 1984 as a funding agency for local NGOs who were not capable of attracting funding from donors on their own competence. Realizing the fact over the years, SAP-Bangladesh expanded its support to include capacity building in the form of training and other technical supports in order to help these NGOs to meet the needs of the people and operate development programs more efficiently. In the last 33 years, SAP-Bangladesh provided technical and financial support to more than 350 NGOs which have field operation programs in 34 districts in Bangladesh. SAP-Bangladesh implemented different development programs since its inception covering 37 districts such as Panchagarh, Lalmonirhat, Kurigram, Dinajpur, Rangpur, Gaibandha, Bogra, Chapainawabganj, Rajshahi, Natore, Sirajganj, Jamalpur, Pabna, Rajbari, Jhenaidah, Jessore, Narail, Madaripur, Gopalganj, Shariatpur, Barisal, Khulna, Bagerhat, Perojpur, Satkhira, Patuakhali, Barguna, Sylhet, Brahmanbaria, Dhaka, Narayanganj, Munshiganj, Comilla, Noakhali, Rangamati, Chittagong, and Coxsbazar covering all the divisions in Bangladesh. Currently SAP-Bangladesh is implementing a total of 12 projects/programs covering 6 districts such as Bagerhat, Patuakhali, Barguna, Bhola, Dhaka and Sirajganj through a total of 38 offices including head office and training center, 22 Branch Offices, 9 Project Offices and 6Area Offices in Bangladesh. It has increased its role in promoting discussions & mass awareness of the community and civil society organizations on important issues of development through opinion poll, publications of bulletins, citizen dialogues, lobbying and advocacy in Bangladesh and South Asia. While SAP-Bangladesh has been working in partnership with local NGOs aimed at promoting the socio-economic, socio-political conditions and position of the poor, it has been directly implementing diversified projects at the community level aimed at promoting the socio-economic, socio-political conditions and position of the poorer section of the community. The experiences gained from the directly implemented projects are widely used in partnership projects and the experience gained from the partnership projects are also widely used in the directly implemented projects. The organization is also implementing the disaster preparedness, response, early recovery, rehabilitation, and Disaster Risks Reduction (DRR) Projects in each and every disaster in Bangladesh since its inception.